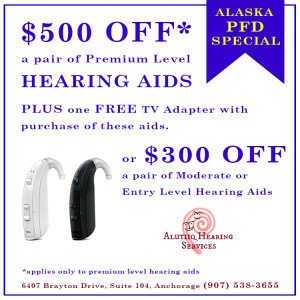 $500* OFF a pair of Premium Level Hearing Aids PLUS one FREE TV Adapter with purchase of these aids. Call Alutiiq Hearing Services at (907) 538-3655 or use the form below to schedule an appointment. Appointments should be scheduled during regular business hours, Monday-Friday, 9 AM to 5 PM. We're happy to accommodate evening and Saturday appointments as well.